Scifi and fantasy films are famously fond of twist endings. Certainly, authors like Richard Matheson and TV shows like The Twilight Zone are a big reason why—but last-act shocks reach back to the era of silent cinema, as anyone who’s seen 1920's The Cabinet of Dr. Caligari can attest. Last-act shocks don’t always work, but they’re almost always memorable. Here are the best and the worst. 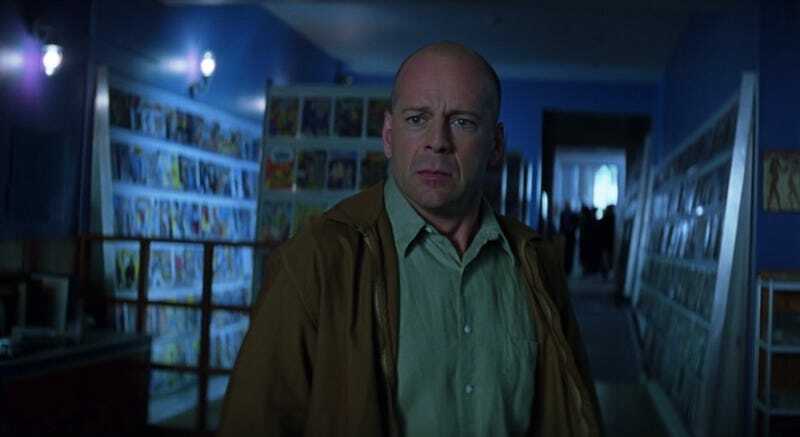 A year after The Sixth Sense, M. Night Shyamalan wasn’t yet being roasted as the “what a twist!” guy—and the end of Unbreakable really was a surprise. Bruce Willis stars as David Dunn, a train-crash survivor who begins to realize he’s got superpowers right when he meets comic-book guy Elijah Price (Samuel L. Jackson), who’s as frail as David is strong. When David finally shakes the man’s hand in the last act, he learns that Elijah, a.k.a. Mr. Glass, has actually been a murderous supervillain all along, and has cast David as his nemesis. Shyamalan’s 2016 thriller Split revealed itself to take place in the same universe as Unbreakable, with trilogy-capping Glass—which will no doubt end with its own shocking reveal—due next year. At the end of the 1968 classic, we learn that astronaut Taylor (Charlton Heston) didn’t actually travel to a new planet 2,000 years in the future. He just traveled 2,000 years in the future, full stop, and is still on Earth—albeit a nuclear war-ravaged version of the world he once knew, now populated by Damn Dirty Apes. The final scene, with the fractured Statue of Liberty, is so iconic now that it’s hard to imagine how startled audiences must’ve been when Planet of the Apes was a new release. The recent Apes movies have offered far more nuanced takes on the fall of humanity and the rise of ape-kind, but there’s no beating Heston’s flail in the surf for pure shock value. Another Heston classic, the twist in 1973's Soylent Green has become its most-quoted line, as well as the only thing most people know or remember about the movie: “Soylent Green is people!” But if you watch the film—which is about an NYPD detective in a very dismal version of 2022, where resources for the non-elite are so scarce that the masses survive on rations manufactured by the shady Soylent Corporation—you’ll see there’s a tremendous build-up to that famous refrain. Between their first two Batman movies, Christopher Nolan and Christian Bale (and Michael Caine) made this tale of rival magicians, with Hugh Jackman co-starring. A professional and personal feud between performers becomes all-consuming, especially when it comes to a show-stopping trick dubbed “The Transported Man.” Though The Prestige’s characters delight in fooling crowds with their tricks onstage (and each other offstage), the movie ends up pulling one over on viewers, too, by revealing that Bale’s character really did have the ability to be in two places at once—because he was actually a they, in the form of identical twins. It’s a shame more people didn’t check out last year’s Alien-influenced scifi thriller Life. It has a great cast (Jake Gyllenhaal, Ryan Reynolds, Rebecca Ferguson) and a “this could maybe really happen in 2017” premise, following a group of ISS astronauts who excitedly discover a living organism lurking in a Martian soil sample. Unfortunately for them, “Calvin” (as they name it) quickly morphs into a killer space monster, leaving the two surviving crew members to make a terrible choice: One will take the creature into deep space and die with it, while the other will return to Earth and warn future explorers. After they blast off, though, the escape pods switch destinations, a twist that’s revealed when the pod that returns home contains not only the wrong astronaut, but also the Martian menace... whose next act will presumably be swiftly wiping out the human race. One of the most unconventional and thoughtful science fiction movies ever also happens to contain one of the genre’s most unconventional and thoughtful twists. We learn early in the movie that main character Louise, a linguist played by Amy Adams, has lost her beloved daughter, and we see glimpses of their relationship and the daughter’s illness as the movie progresses and focuses on its main plot. But it’s not until the end of Arrival—after Earth’s alien visitors have shared their highly evolved language, which Louise is able to interpret as a means to see the future—that we learn her visions are not flashbacks, as would be expected, but flash-forwards. It’s a profound moment for both the character and the audience, as we realize she knows her child will die young, and yet she still plans to embrace all of the joy that will lead up to her life’s greatest loss. Suburban teenager Donnie (Jake Gyllenhaal) sleepwalks, meets a ghoulish rabbit that tells him the world’s going to end in a month, and returns home to find a jet engine has obliterated his bedroom. Having narrowly escaped death, but knowing that doomsday is coming, Donnie finds his life becoming a surreal meld of high-school drama, worm holes, and apocalyptic visions. Chaos descends as the end draws near (including the accidental death of Donnie’s new girlfriend after a Halloween party) but then everything is revealed to have all been a dream that began with a premonition that’s seconds away from coming true. Enter the jet engine... and exit Donnie. Way back in 1980, Darth Vader’s confirmation that “I am your father” to Luke Skywalker was totally mind-blowing—and in a series that has since showered us with twists (including maybe the biggest one in recent years, Han Solo’s murder at the hands of his own son in The Last Jedi), this is still the most potent. Though internet spoilers were a long-off danger in 1980, a Star Wars fan did have to practice self-preservation by avoiding anyone who might spill the beans—like, say, Darth Vader actor David Prowse. You knew Shyamalan was going to make this list more than once. It’s a toss-up between The Village and The Happening for which twist is most frustrating, but I went with The Village because its betrayal is that much worse. It’s not a terrible movie... until the very end. Bryce Dallas Howard’s “blind girl” acting technique isn’t the greatest, but the cinematography is gorgeous, and the bizarre, cloak-wearing monsters that menace the isolated settlement are genuinely unnerving. It’s not until the reveal that all those old-timey shenanigans were taking place in the present day all along, with the younger generation kept cruelly unaware of the outside world, that the movie becomes utterly infuriating. And then it ends, and you’ll never get that time back. In which a nine-year-old kid (played by a 12-year-old actress) is revealed to be not just a bad seed—but a 30-something con artist with a taste for murder, a fondness for hitting on her father figures, and professional-level de-aging make-up skills. After spending the entire movie trying to protect his family and neighbors from the titular menace, which envelops his town and drops horrific monsters all over the place, David (Thomas Jane) believes all hope is lost. His car’s out of gas, and there’s nowhere left to run. Since a quick death seems preferable to being devoured by giant spider creatures, David uses the last of his bullets to mercy-kill the people he’s been trying to help, including his own cherubic young son. He’s resigned to meeting his fate at the hands of the monsters... then, what’s this? The US Army swooping in, stomping monsters and saving people... like the ones he just shot to death? And they could have survived if he’d just waited a few measly minutes? Aaaaggggghhhhhh. If the 1968 original had one of the best twists ever, the 2001 Tim Burton remake—the one that nobody ever talks about anymore, with good reason—has one of the worst. In this version of the story, astronaut Leo Davidson (Mark Wahlberg) still travels into the future, but he’s able to escape at the end and, apparently, travel back in time to Earth. The twist is that Earth is now populated by you-know-who, with the Lincoln Memorial remade in tribute to the evil military leader (Tim Roth in chimpanzee mode) Leo thought he’d left behind. Presumably, the next film in the series that was never made would’ve been called Prison Planet of the Apes, because where else would Leo be going after getting swarmed by all those monkey cops?